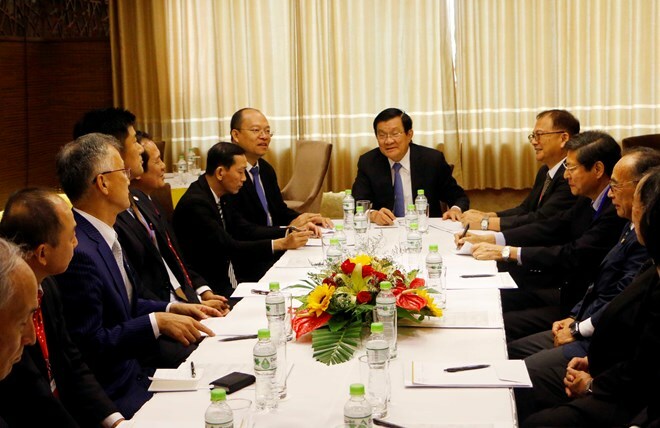 Leaders of the Mekong Delta city of Can Tho November 3 held a meeting with representatives from a number of Japanese enterprises who came to the city to attend the 4th Vietnam-Japan culture and trade exchange. The meeting, chaired by former President Truong Tan Sang, saw the participation of representatives from more than 10 Japanese firms and the JapanExternal Trade Organisation (JETRO)in Ho Chi Minh City. Speaking at the event, former President Sang said Vietnam and Can Tho city in particular are calling for investment in agriculture, electronics, health tourism, and training cooperation. He stressed that if Japanese businesses invest in these fields, they will surely receive the attention of Vietnamese customers because Japan's qualification and technology have been acknowledged. Meanwhile, Chairman of the municipal People’s Committee Vo Thanh Thong said the city is very interested in the field of car recycling that a Japanese business introduced in the framework of the exchange, and hopes for an investment project in this sphere. Can Tho is also looking for cooperation with a Japanese enterprise which specialises in mushroom cultivation, he said, adding that the enterprise can connect with Can Tho University to consider the possibility of implementing the model in the locality. Thong also suggested cooperation between Kobe Technology University of Hyogo prefecture and Can Tho University of Engineering and Technology to develop information technology sector. Kyoshiro Ichikawa, General Director of I.B.C Vietnam Co., Ltd, who is also a consultant from the working grouponJapan-related issues (Japan Desk) in Can Tho, said through the exchange, Japanese enterprises got an insight into Can Tho city, adding that he hopes they will introduce more Japanese firms to the Vietnamese city in the time to come. The fourth Vietnam-Japan cultural and trade exchange programme was projected to host 120 pavilions, including 90 introducing the nations’ commercial products. A series of activities have been held during the programme, including a photo exhibition on the Vietnam-Japan friendship, a forum on Japan-Mekong cooperation, and a ceremony announcing the establishment of the Vietnam-Japan friendship industrial zone./.